We are both horrified, and very, very, confused by the video Colorado Rising has on Facebook featuring a horrible actress with a ridiculous accent making fun of the very people they claim are sick and dying as a result of natural gas development. 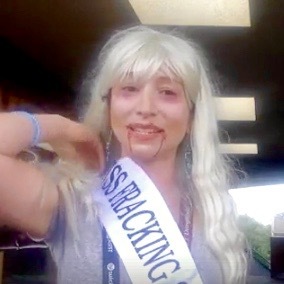 Meet “Miss Fracking 2016,” who apparently was killed by fracking and is now a zombie spreading the humorous message of bringing common sense to this issue. Click on the link here and scroll down until you see the laughing zombie. The fractivists in this video think being dead is a very funny and clever way to raise support and gather signatures for their anti-fracking ballot initiative. Memo to the Secretary of State’s office: You might want to check those petition signatures very closely for zombies, also known as dead people. This spoof tells us that even fractivists don’t take their own disproven claims seriously that energy production is a health danger.